In a game where every yard was a struggle, the ‘Bama defenders took matters into their own hands, scoring a pair of touchdowns just 13 seconds apart in the third quarter to turn an offensive slog into a 24-6 rout of defending national champion Clemson in the Sugar Bowl semifinal game Monday night. There would be no drama in the nightcap. With Deshaun Watson off to the NFL, top-ranked Clemson (12-2) simply had no answer for Nick Saban’s latest group of defensive standouts. The Crimson Tide’s win set up an all-Southeastern Conference showdown for the national title – with Saban matched against his former defensive coordinator, Georgia coach Kirby Smart. 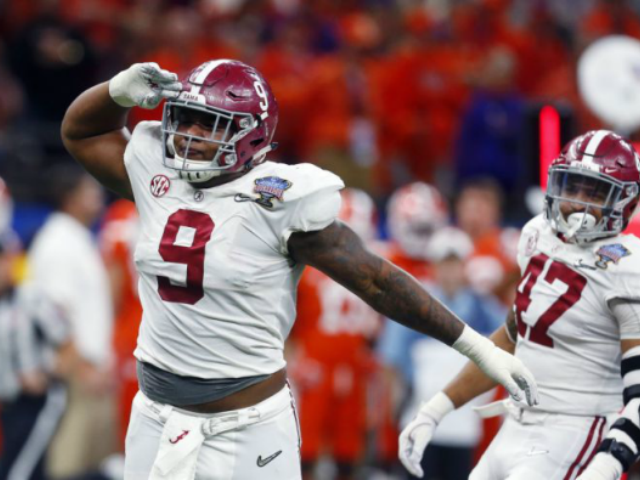 It began with 308-pound defensive tackle Da’Ron Payne picking off a wobbly pass, the ball fluttering through the air after besieged Clemson quarterback Kelly Bryant was hit as a threw – a familiar sight on this night. After Alabama drove to a first down at the Clemson 1, Payne re-entered the game – presumably to add another big body for blocking purposes. That’s certainly what Clemson was thinking, totally biting when Hurts faked the handoff.